Every time you seek a new job, you need to make sure you complete the essential steps. 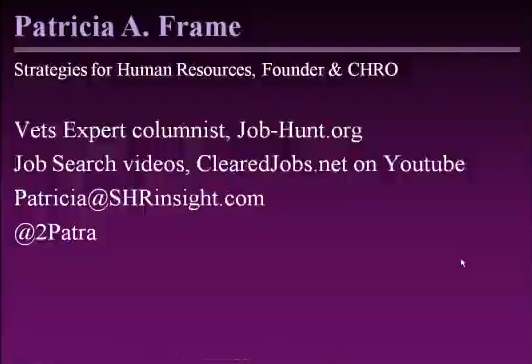 During GovWin’s latest event in the GovCon Careers Webinar Series, Patricia A. Frame of Strategies for Human Resources covered the key elements of a professional resume and cover letter. Ask yourself: “What are you selling? Who is your target market?” A resume is your advertisement. It is your version of a proposal. Do not recycle what you have submitted previously. Instead, take time to research yourself, the company and the position you are applying for. Once you have a clear picture of your own capabilities, what the company is about and what their needs are, you will increase your chances of landing the job. Resumes and cover letters need to grab your target audience immediately. 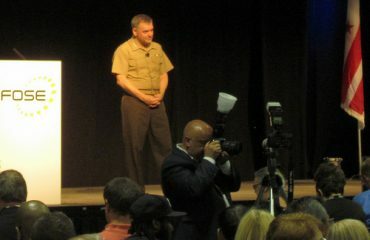 Your goal with these two documents is to show a pattern of actual achievement and get the reader to contact you for a phone or in-person interview. For each job you have held, show the situation you were in, the actions you took and the results. Demonstrate your growth and tailor what you have accomplished to the position you are applying for. Show your target audience what you have to offer them so they have no reason to turn you down. Since hiring managers and human resource professionals receive so many cover letters and resumes for a limited number of positions, your time to make an impression is short. You may have 30 seconds to grab the attention of your target audience, so be sure to use the target audience’s language. How does the company describe the position they have open? What keywords do they use? Include these keywords and descriptions to show you fit what they need. Use the “golden area” of your resume — the top half of the first page — with the greatest amount of efficiency. Do not overdo your contact information or include irrelevant details. Hit the reader with the qualifications that meet their needs so they keep reading. Keep your cover letters concise: two to three paragraphs. Right out of the gate, answer these questions for the reader: “What job are you applying for?” and “Where did you find out about the opportunity?” For the next paragraph or two, advertise your skills and how they meet the hiring manager’s needs. 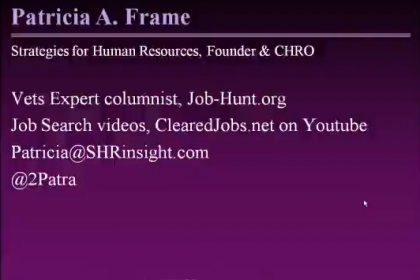 To reach Patricia Frame, you can find her work at Job-Hunt.org in the Vets Expert column, job search videos on ClearedJobs.net on Youtube. You can also e-mail her at Patricia@SHRinsight.com as well as find her on Twitter@2Patra.